Here is a sneak peek at some of the exciting live auction packages at the STAR Gala 2019: Dazzling Diamond Soirée. Prepare to be dazzled during an evening that brings together STARability Foundation supporters and guests as we share our mission and stories of lives transformed. Thank you to the generous donors who have helped create this wonderful collection of live and silent auction items. Get ready to “Bid for the Stars”! This is the ultimate vacation for any Francophile, or anyone looking for a private, luxurious retreat for up to ten (10) people in the heart of the historic, beautiful Bordeaux region. You will spend seven (7) nights in a five (5) bedroom 18th century, stunningly-restored estate in Rauzan, a medieval village just 10 miles from Saint-Émilion, with thousands of acres of vineyards and chateaux a short drive away. You will also enjoy the wonderful amenities on the property’s 6 acres, including a pool and a small private lake, a fully-equipped kitchen, modern conveniences and gorgeous views from the terrace. Meander into the village where you can explore the medieval castle ruins and visit the local bakery, butcher, restaurants and shops. No visit to Bordeaux would be complete without tasting the region’s world-renowned wines. You and your guests will experience a private wine tasting and tour for ten (10) people at Chateau Fonplegade in historic Saint-Émilion. Fonplegade literally means “fountain of plenty” and grapevines have thrived at this exceptional site since the late 1500s. Savor the winery’s biodynamically-farmed wines of uncommon grace and elegance in an intimate, spectacular setting. Chateau Fonplegade’s modest production makes this an exclusive opportunity, and you will be delighted with the hosts’ unparalleled hospitality. Pick your dates (mutually agreeable) for an unforgettable eight (8) day, seven (7) night vacation with your family/friends in the spectacular Canadian Rocky Mountains. You will be staying in an executive-style 3 bedroom, 2½ bathroom family home in Canmore, Alberta that very comfortably sleeps six (6) adults. The accommodations include a fully-appointed and equipped kitchen, a cozy family room with a gas fireplace, and an upper loft featuring a large-screen TV and a bumper pool table. A full back deck with a gas grill offers a majestic view of the iconic Three Sisters mountains and numerous other peaks. Canmore is just a 70-minute drive from Calgary International Airport (YYC), a 15-20 minute drive from the world-renowned town of Banff within Canada’s oldest National Park, and 45 minutes from beautiful Lake Louise. Summer visitors can enjoy playing golf on several challenging mountain courses (Silvertip, Stewart Creek, Kananaskis, Banff Springs), white-water rafting, hiking (particularly to the top of nearby Ha Ling Peak), mountain biking, horseback riding, and soaking in the natural, mineral springs hot pool in Banff. Those opting for a winter holiday can partake in downhill skiing at nearby world-class resorts (Sunshine Village and Lake Louise), cross-country skiing, snowshoeing, fat-tire mountain biking, ice skating, and tobogganing. Canmore and nearby Banff are also well-known for their wide range of high-quality restaurants and pubs. This getaway also includes golf and lunch for four (4) at Stewart Creek Golf & Country Club. Designed by renowned golf architect Gary Browning, the 18 holes at Stewart Creek have been sculpted into the magnificent Rocky Mountain landscape – a truly picture-postcard setting. Best times to visit Canmore in the summer are mid-June to early September and in the winter early March to late April. Trip must be booked by March 30, 2020. Blackout dates are May 6-18, 2019 and December 10, 2019 – January 5, 2020. Eight (8) day, seven (7) night stay at a three (3) bedroom executive-style home in Canmore, Alberta (Canada) for up to six (6) people. Golf and lunch for four (4) people at Stewart Creek Golf & Country Club. First, choose ten (10) people that you would like to escape with to a private home on a private island. Next, pick a mutually-agreeable date, and finally, visualize your group traveling by boat (the only way to get there) to an architecturally-stunning home set on 5 ½ acres on Keewaydin Island, a primary barrier island between Naples and Marco Island. Upon arrival, you will be greeted with an array of fine wines and a chef-created, island-inspired gourmet dinner to enjoy under the stars on this beautiful, unspoiled island. The surrounding 5 ½ acre property combined with a protected species habitat makes for nearly 8 miles of deserted, white-sand beach. Make your plan to escape for this exclusive experience! To be scheduled on a mutually agreeable date. Gargiulo Vineyards is a family-owned winery committed to handcrafting exceptional wines from two Oakville estate vineyards, Money Road Ranch and 575 OVX. Four (4) people will be the guests of Valerie and Jeff Gargiulo for a magical weekend in the Wine Country during harvest. You will arrive Friday, October 4, 2019, and be hosted at a dinner at the home of Bill & Deb Cary. Saturday, you will have a private tour and tasting at Gargiulo Vineyards. See first-hand how grapes become wine with the winemaker, Kristof Anderson. If they are harvesting that day you are welcome to help harvest or sort grapes, then spend the rest of your day visiting other wineries in the valley. Saturday night you will join Valerie, Jeff, and a handful of musicians for dinner at their home overlooking their vineyard, followed by a private, living room concert. The weekend culminates on Sunday with a music event known as The Oakville Sessions. Grammy-award-winning musicians join Jeff Gargiulo on stage, along with his band, the Silverado Pickups, for an afternoon filled with music, great food, and even better wine. You won’t be the same after experiencing this celebration of soil, vines and the love it takes to make these special wines! This once-in-a-lifetime experience includes accommodations for two (2) couples, or four (4) people, for three (3) nights at the Archer Hotel Napa, a luxury, boutique hotel in downtown Napa. Calling all Chicago Cubs fans! Grab nine (9) friends and head to the Windy City to see the Cubs in action at historic Wrigley Field. You will get ten (10) tickets to a 2019 season home game with excellent seats – Section 120, Field Box Home Plate. Great panoramic views from behind home plate; considered to be some of the best seats in the house by diehard Cubs’ fans. All home games are available in regular season. Before the game, treat your guests to dinner at Tavern On Rush, an upscale, contemporary steakhouse on famous Rush Street. Dinner at this coveted venue features a chef-driven menu and beverages for ten (10) in the upstairs, private dining room. Get primed for the Cubbies while enjoying classic American fare with friends in a memorable setting. Chicago Cubs tickets for a 2019 season home game on a mutually agreeable date. Actual tickets are not available until mid-March. Ten (10) tickets to a Chicago Cubs 2019 season home game, Section 120, Row 8, Seats 1-5 and Section 120, Row 9, Seats 1-5. Dinner & beverages for ten (10) in a private room at Tavern on Rush. Upon arrival, enjoy a continental breakfast with the General Managers of both Waterside Shops and Saks Fifth Avenue. Spark up your look with a dazzling makeover and beauty products from Saks Fifth Avenue. Celebrate in style as champagne and sweet treats await you at the legendary Tiffany & Co. Try on stunning diamonds and receive a special gift. Stroll along the shimmering fountains to Tumi and select a travel piece for your next adventure. Recharge with lunch & sparkling wine at BrickTop’s. Pick a perfect pair of glittery evening shoes or a ‘stellar’ evening bag at famed Salvatore Ferragamo. Tour for two (2) guests and are required to take the tour together. 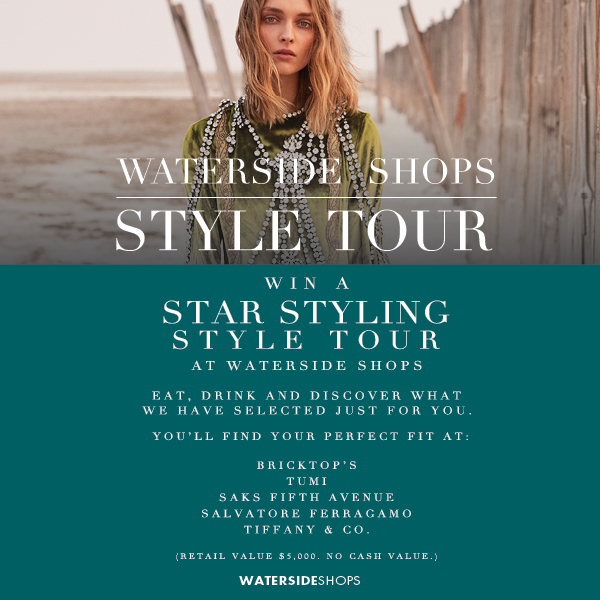 Style Tour shops include; BRICKTOP’S, TUMI, SAKS FIFTH AVENUE, SALVATORE FERRAGAMO, TIFFANY & CO. This is your opportunity to experience Tuscany like you’ve never seen it; through the eyes, ears, palate and insider access of your own personal guide, Camilla Pedersen. Four (4) people will take this unique, exclusive getaway and absorb Tuscany’s breath-taking history, amazing sceneries, and world-renowned cuisine and wine. You will go beyond the beaten path, meet the locals and live the passion that every true respecting Tuscan has for his region. A morning cappuccino, an afternoon gelato, fantastic culinary stops and endless glasses of the wonderful Tuscan wine will be of vital importance in your journey to becoming true Tuscan connoisseurs. From the moment you arrive in Florence, you will be under the guidance of incomparable Camilla, who will arrange for private transfer service from the airport to the stunning medieval town of Siena. You will stay for four (4) nights in a luxury, boutique hotel in the center of Siena, close to restaurants, shops and cafes. Camilla will host a three (3) course welcome dinner with wine, and you will spend the next day exploring the wonders and beauties of Siena – ‘con calma’ – at a comfortable pace with time to enjoy beverages, snacks, and lunch in a favorite local ‘osteria’. A visit to Tuscany is not complete without a trip to the region’s iconic vineyards, and you will travel to Chianti Classico district in a private car service with Camilla as your guide on these behind-the-scenes tours and tastings. Other excursions on this fabulous trip include Montalcino and Pienza – two of Tuscany’s finest gems. Transfer service from Florence to Siena. Accommodations for four (4) people for four (4) nights in a luxury, boutique hotel B&B in the center of Siena (double rooms). Full-day tour of Siena with local guide including lunch and small tastings during the day. Wine tour of the Chianti Classico district in a private minivan and with private tour guide. 2 wine cellars/tastings and lunch. Full-day tour of Montalcino and Pienza with private minivan and private tour guide. Four (4) carats of dazzling diamonds sit amongst these three (3) stunning diamond jewelry pieces. 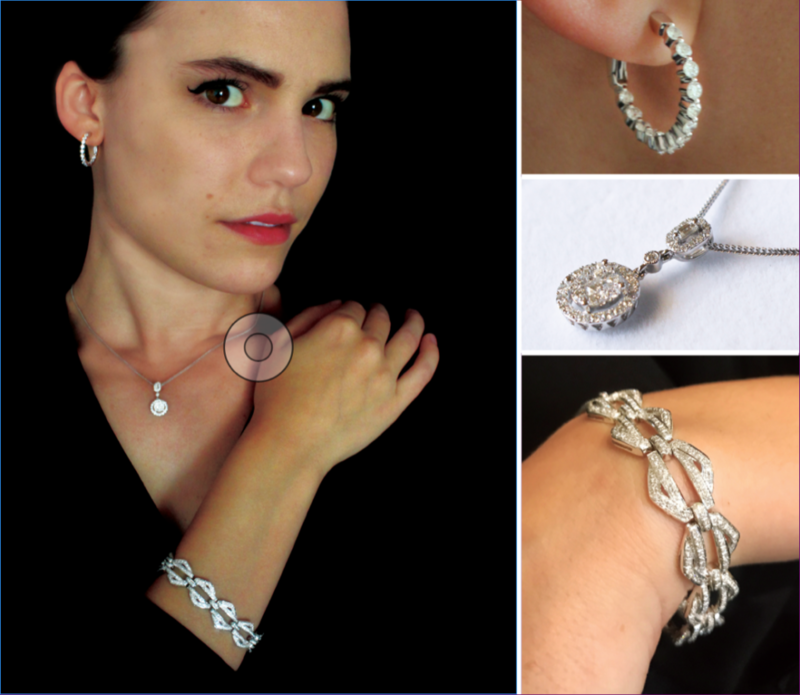 You or someone special will look fabulous in the elegant and timeless gold and diamond bracelet, pendant and earrings. Wear them together or separate – diamonds are always in style! Certificates of Authenticity by Onomoli Fine Jewelry. AND MUCH MORE THE NIGHT OF THE EVENT!